Korean red ginseng, also called Chinese ginseng or Asian ginseng, is used for treating health ailments, improving your endurance and minimizing stress, according to the University of Maryland Medical Center. However, the correct dosage depends on what you're aiming to treat. Because Korean red ginseng can be harmful in high doses, you should talk with your doctor about the exact amount you should be taking. The proper dose of Korean red ginseng depends on the level of ginsenosides, which are steroid glycosides, or organic plant compounds, found only in ginseng. Both Korean red ginseng and American ginseng typically contain about the same level of ginsenosides, with extracts containing 4 to 7 percent. Based on this level of ginsenosides, the proper extract dose ranges from 100 to 400 milligrams daily, according to Drugs.com. If you're using Korean red ginseng root, possibly to make tea, the dosage of crude root is 0.5 to 3 grams a day. Asian ginseng could lessen your chance of catching a cold. If this is your goal, take 400 milligrams of an extract a day for four months, the University of Maryland Medical Center recommends. Generally 100 milligrams of extract twice daily is used for overall immune health. To lessen issues with erectile dysfunction, taking 900 milligrams of Asian ginseng two or three times daily can help. If you want to boost your endurance for sports, the recommended dose is 2 grams of powdered root each day, or 200 to 400 milligrams of the extract form. Korean red ginseng can be helpful for relieving stress, too. In this case, take an extract with at least 1.6 milligrams of ginsenosides daily. Korean red ginseng isn't typically something you want to take every day, as it can lose its efficacy. Usually you need to take it in cycles. As an example, take your supplement daily for about two to three weeks. For the following several weeks, stop taking it all together. Then on the following two- to three-week cycle, take it every day again. Cycles last for short or long periods of time, depending on which ailment you're trying to treat. Ask your health care provider about the ideal time frame for your specific needs. Taking too much Korean red ginseng can affect your energy levels. High doses could make you jittery and nervous, interrupting your sleep patterns. Although rare, you may also experience high blood pressure, anxiety, diarrhea, headaches, low blood sugar or nosebleeds. The herb also has poor interactions with all kinds of medications, including blood pressure pills, diabetes meds, stimulants, diuretics and painkillers. This is why it's essential to let your doctor know about everything you take, even if it's just an over-the-counter herb like Korean red ginseng. 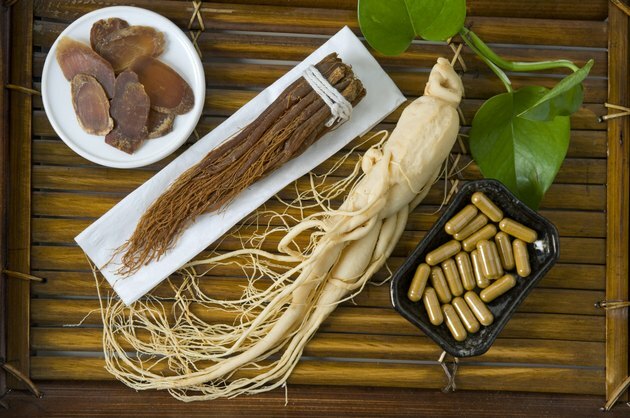 How Much Panax Ginseng Is Safe?